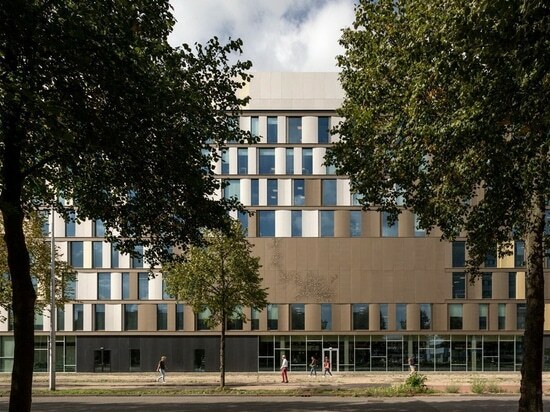 the newest education facility for HU university of applied sciences in the netherlands by schmidt hammer lassen architects is a compact, eight-floor building defined by bold, graphic lines. 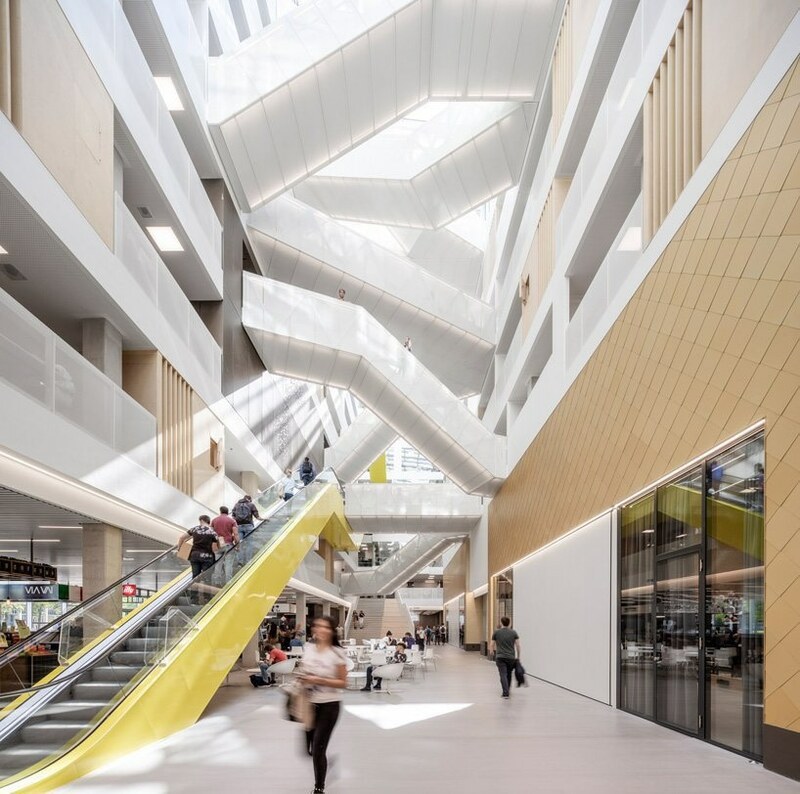 home to eight educational institutes, the 22,310 sqm structure’s different spaces are connected with a web of stairways, escalators, and indoor bridges crisscrossing over its main atrium. 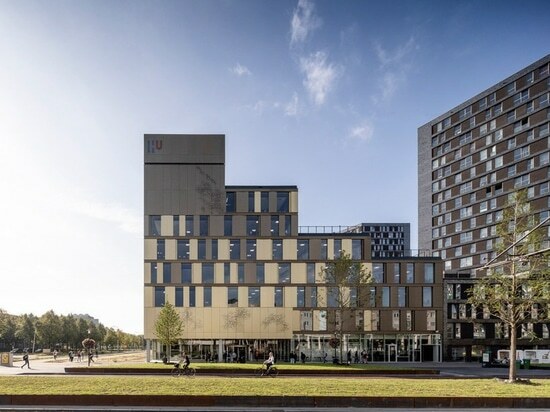 situated in utrecht’s heidelberglaan street, schmidt hammer lassen‘s new building is one of the five completing the kasbah masterplan; an effort to consolidate the HU university’s footprint, whose previously independent institutes were spread across some 30 locations around the city. the home of eight such educational facilities in the economics, management, information communication and technology, and media and communication sectors, the building features an interwoven interior layout that encourages different users to intersect within it. 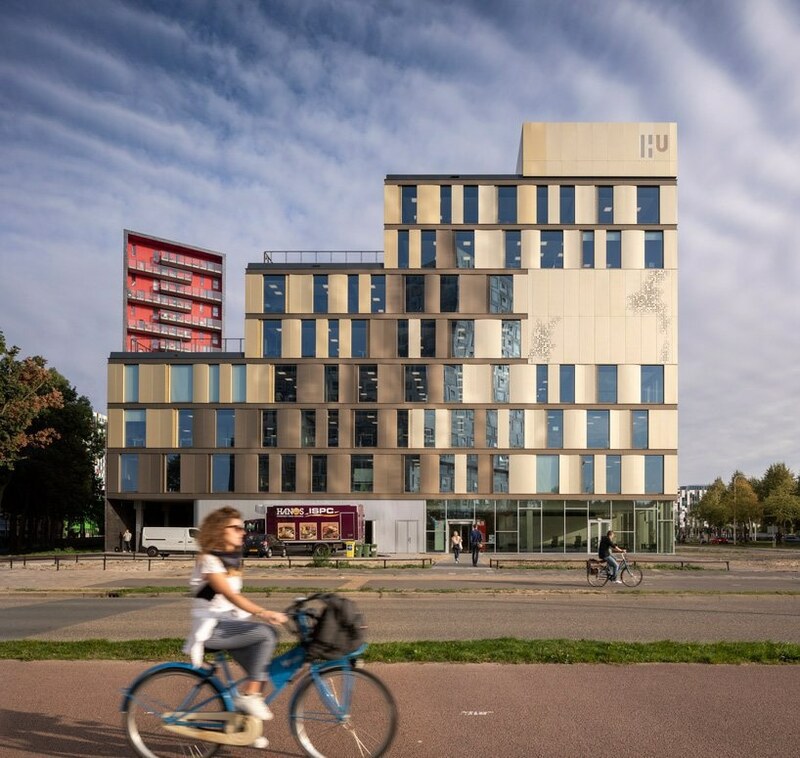 the exterior façade features neutrally-colored anodized aluminum cladding, with one color dissolving into the next to create a gentle patchwork effect. from the east side of the building, two 90-seat lecture halls, an advanced television studio for the media school, and a meeting center can be identified by the solid patches of cladding. 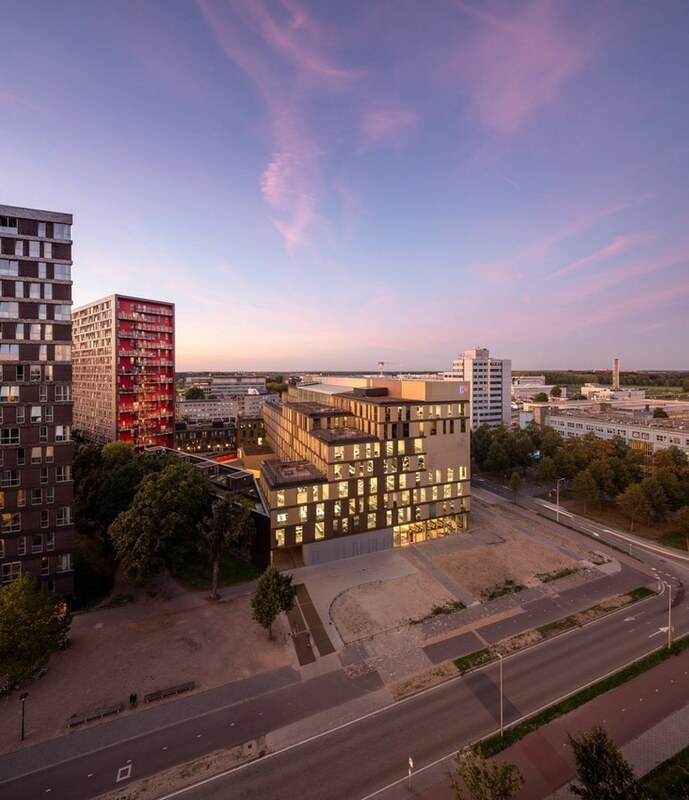 on the opposite side, a new inner courtyard is created towards the neighboring student housing block, which steps up towards the east façade to allow it to connect with the existing structures. 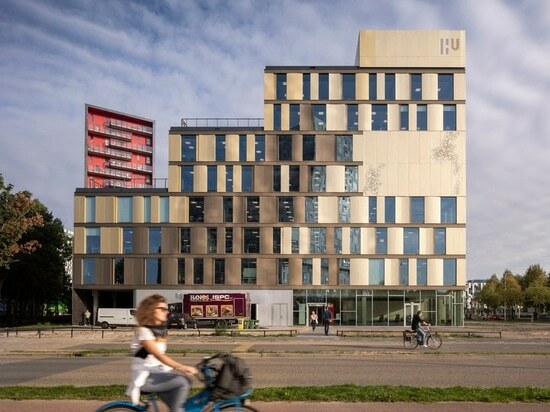 schmidt hammer lassen has linked the exterior and interior of the building using the moiré pattern of the aluminum cladding, which can be found not only on the exterior façade, but also on the internal staircases. the perforation on the staircases plays a role in the acoustics of the space,while beneath them are sound absorption materials that dampen the noise made by the thousands of people using the building daily. the ground level of the school is designed to erase the boundary between indoor and outdoor by putting educational activities on full display through full-length windows. 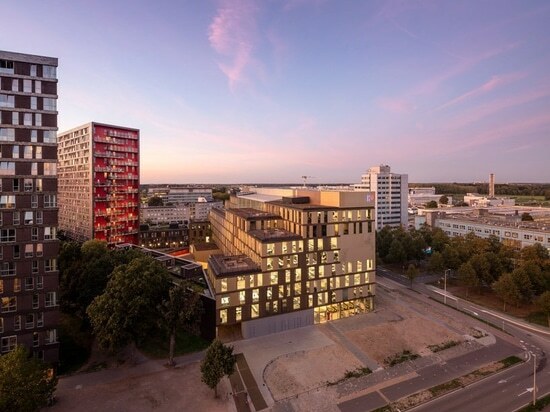 this transparency extends into the design of two lecture halls, that feature glass walls and a retractable wall similar to a garage door which can open up completely to allow connectivity with the main entrance hall. moving up through the atrium, each of the university’s institutes has a dedicated student and faculty center within the building, which serves as the ‘beating heart’ of each department, and are spread out among the top six floors. 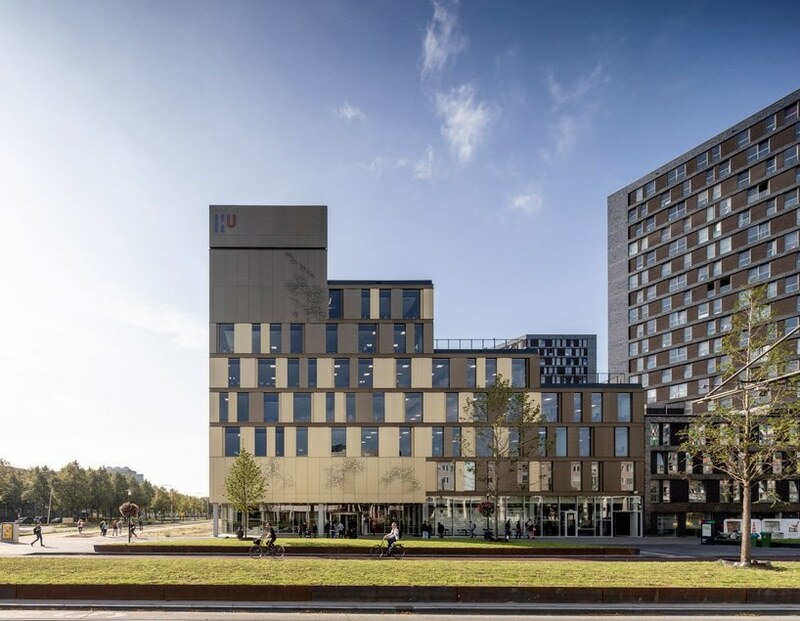 more than 60 classrooms, two smaller lecture halls that each seat 90 people, and 20 project group rooms, are located throughout the building, all of which are shared across institutes. timber boxes placed along the central atrium are concentration workspaces fit for one or two people to meet or study. 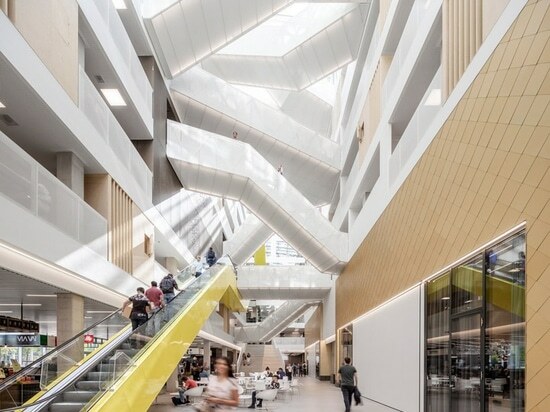 the white, off-white and timber color scheme of the university’s interior is accented with a pop of chartreuse that lines the three escalators that transverse the atrium.